The Golden State (California) Tobacco Securitization 5.75% issue due in 2047 trades at around 69, for a yield of 8.5% (Cusip 38122NPA). Pimco's Bill Gross and other savvy fixed-income investors have loaded up on municipal bonds backed by tobacco-company payments to the states. The bonds yield about 8%. While high-grade municipal bonds with 30-year maturities are yielding 4.5% to 5.5%, some tax-free bonds backed by domestic tobacco-company payments sport yields of more than 8%. Indeed, the $40 billion of tobacco-settlement munis offer the highest yields of any major sector of the tax-free market. They have attracted big investors, including Bill Gross, manager of the $243 billion Pimco Total Return Fund (ticker: PTTRX), and muni-fund groups such as Oppenheimer Rochester seeking high yields. Many states have issued tobacco munis, including California, New York, New Jersey, Ohio and Illinois. The bonds are backed by annual payments that will be made in perpetuity by domestic cigarette companies under the 1998 Master Settlement Agreement (MSA) reached with 46 states to resolve lawsuits filed by the states to recoup the cost of treating sick smokers. The four remaining states settled separately with Big Tobacco. The table below shows specifics on three of the largest individual issues. The Golden State (California) Tobacco Securitization 5.75% issue due in 2047 trades at around 69, for a yield of 8.5% (Cusip 38122NPA). The Buckeye Ohio 5.875% issue due in 2047 (Cusip 118217AU) also fetches about 69, for a yield of 8.8%. The Tobacco Settlement (New Jersey) 5% due in 2041 (Cusip 888808DF) trades at about 64, for a yield of 8.25%. States–and some local governments–mostly issued the debt to plug budget deficits. In so doing, they were able to obtain, in one lump sum, the present value of future MSA payments, rather than using future payments over many decades to treat sick smokers, as was intended. The tobacco-muni sector carries more risk than most segments of the tax-free market, because these bonds typically are backed only by annual MSA payments and not by any state guarantee. The payment for 2010, which was made two months ago, totaled $6 billion. The bonds, originally sold with 5% to 6% yields, have fallen in price because MSA payments haven't met expectations. The payments are pegged to U.S. cigarette consumption, which has fallen more rapidly than anticipated in recent years, due to increased national restrictions on smoking, as well as higher federal and state cigarette taxes. Consumption dropped by 9% in 2009, and another 6% last year, to 304 billion cigarettes (15 billion packs). That is well below the 441 billion sold in 1999. Many assumed 2% annual declines when the bonds were sold. Major cigarette companies, such as Altria (MO), Reynolds American (RAI) and Lorillard (LO), have been able to offset volume declines with sharp price increases. MSA payments, however, reflect domestic cigarette-sales volume, not industry profits. The payments benefit from an inflation adjustment of at least 3% every year. Standard & Poor's downgraded many tobacco bonds in November to junk status. Moody's gives most major deals tobacco deals investment-grade ratings, but barely, and might cut ratings to junk. S&P cited "revisions of the base-case and stress-case assumptions we used in the cash-flow-stress scenarios for these deals." S&P is worried that falling cigarette consumption could cut MSA payments, and imperil full payment of principal and interest on tobacco debt. TOBACCO-MUNI BULLS say that the lofty yields compensate for the risk, especially as the average corporate junk bond yields 7%. An 8.5% yield on a Golden State issue is equivalent to a 13% fully taxable yield for a Californian in a 35% federal tax bracket. "You can't find any high-yield bond with a 13% yield" and the same credit quality of the tobacco munis, says one hedge-fund manager who owns the debt. There has been little new issuance in recent years. The major institutional dealers are Citigroup and Goldman Sachs. Since there is no muni-bond exchange, individuals must buy bonds in an over-the-counter market, where price spreads can be wide. Potential buyers might want to check the http://investinginbonds.com Website for information on price history. Input the bond Cusip number for that history. One quirky feature of tobacco munis is that issuers can't seek bankruptcy protection. Investors are entitled to each bond's earmarked MSA payments, whatever they turn out to be. Interest payments could come up short, and principal repayment might be delayed or not made in full. "The bonds are generally appropriately priced, given cigarette consumption projections. There may be a shortfall, depending on the bond's structure," says Tom Metzold, co-director of muni investments for Eaton Vance, which owns tobacco munis. In its most recent semiannual report, managers of the Oppenheimer Rochester National Municipals Fund (ORNAX) wrote that "carefully researched MSA-backed bonds are fundamentally sound, and…will continue to provide high levels of tax-free income to the long-term benefit of our yield-seeking investors." The fund has 19% of its $5.6 billion in assets in tobacco munis, its largest sector-weighting. Pimco could be the biggest holder of such munis. The Total Return fund owns 25% of the Buckeye 5.875% issue. Tobacco munis aren't for everyone, but many wealthy individuals could benefit from investing a small portion of their tax-free portfolios in these high-yielding securities. So-called tobacco munis and other high-yielding bonds have been crunched lately. One of the largest tobacco munis, the Tobacco Settlement Financing Corp of New Jersey 5% issue due in 2041 (CUSIP: 888808DF6), has fallen about 15% since early May to a price of 75 (par value is 100) and yields around 7%. The New Jersey issue and other tobacco munis from such states as Ohio and California are tax exempt but carry considerable risk because they are secured only by payments to states under the 1998 settlement with major cigarette companies over the states' cost of treating people with smoking-related illnesses. The New Jersey issue, for instance, has a junk rating of B2 from Moody's and B-minus from S&P. Falling cigarette consumption is the major risk, although most bonds already assume modest annual declines. Their appeal is the combination of high yields and tax exemption, with the New Jersey issue carrying a 10%-plus taxable equivalent yield. The BlackRock Muni Target Term Trust (ticker: BTT) is down to $19 from its IPO price of $25 last summer and now trades at a 4% discount to its net asset value. It yields nearly 6%. The Nuveen AMT-Free Municipal Income Fund (NEA) trades around $13, an 8% discount to its NAV, and yields 6.3%. The largest open-end muni fund, the $38 billion Vanguard Intermediate Tax-Exempt (VWIUX), now yields over 3%. The iShares S&P National AMT-Free Muni (MUB), the largest muni exchange-traded fund, has rallied in the past few days and trades around $105, for a 3% yield. The recent selloff in the bond market has left municipal bonds at strikingly attractive levels. How to find yields equivalent to 8% on taxable bond. The sharp selloff in the municipal-bond market has produced 5% yields on many long-term issues, up from about 3.5% at the start of this year. Yields are even higher—at about 7%—on many closed-end muni funds that boost their yields with some financial leverage. 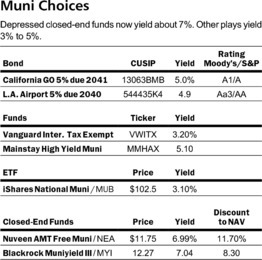 Intermediate-term munis with 10-year maturities are yielding about 3%, and so is the largest muni open-end fund, the Vanguard Intermediate-Term Tax Exempt (ticker: VWITX). Munis look good relative to U.S. Treasury bonds, high-grade corporates, and junk bonds. Perhaps more important, absolute muni yields finally are looking appealing. "If you have a diversified portfolio, you probably should have a fixed-income allocation, and munis offer some of the best relative value in the bond market, especially given higher tax rates this year" says John Loffredo, a co-manager of the MainStay High-Yield Municipal Bond fund (MMHAX). He points out that a key index of triple-A-rated munis with 30-year maturities was yielding 4.33% last week, versus a 30-year Treasury yield of 3.85%. Most long-term munis yield appreciably more than this index. It's unusual for munis to yield more than Treasuries—they often yield roughly the same, or even less, thanks to the tax advantage. In the nearby table, we show two high-grade long-term issues that last week yielded about 5%—a California 5% general-obligation bond due in 2041 and a Los Angeles airport 5% revenue bond due in 2040. Just last week, a new muni issue from the Philadelphia Water and Waste Water Authority had a top yield of 5.22% for a 30-year issue. Loffredo and others say 5% muni yields often stimulate interest from retail investors. And remember, a 5% muni yield is equivalent to more than 8% on a fully taxable bond for someone in the top 39.6% federal tax bracket (we aren't even including the 3.8% Medicare surcharge). That's more attractive than junk bonds, where yields now average about 6.3%. Junk bonds do have shorter maturities, but many 10-year munis are yielding over 3%, which is equivalent to 5% on a taxable bonds. Long-term munis also stack up well against stocks, assuming total returns on stocks (appreciation plus dividends) revert in the coming years to their historic norm of 7%. That equity return is before any taxes on dividends or capital gains. Now, a word of caution: The muni market has never been especially liquid, and trading is even trickier in the wake of new, postcrisis regulations for Wall Street firms. The upshot: wide bid-ask spreads, especially for relatively small trades of less than $1 million. As a result, many pros advise individual investors to stick with mutual funds or exchange-traded funds. Another alternative is to buy new-issue munis (which don't carry any commissions) and hold them until maturity. The recent drop in the muni market reflects a decline in the Treasury market, persistent outflows from muni open-end funds, and credit jitters in the wake of Detroit's bankruptcy. But as Loffredo points out, muni credit quality has generally been improving, thanks to stronger tax revenues nationwide. There have been some important recent credit-rating upgrades, including California and the Atlanta water system. The iShares municipal-bond ETF is down nearly 10% since the start of the year. LONG-TERM MUNI-BOND funds have been hit this year, often declining 5% or more. The losses have been even steeper among closed-end funds, which are traded like stocks, with most changing hands on the New York Stock Exchange. Many closed-end funds are down 15% to 20%, hurt by the drop in muni-bond prices, financial leverage, and widening discounts to net asset value. The typical muni closed-end fund has about $3 in assets for every $2 of shareholder equity, meaning a dollar of borrowings. A group of Nuveen closed-end funds, including the Nuveen AMT-Free Municipal (NEA) trade at roughly 10% discounts to NAV and yield about 7%. Investors would have to buy a speculative junk bond yielding 11% to 12% in order to get a similar tax-equivalent yield. The largest muni ETF, the iShares National AMT-Free Municipal (MUB), offers fairly good liquidity, thus facilitating traders. The ETF can, however, trade at a discount to its NAV in difficult markets like those recently. It traded on Friday at about $102 and yielded about 3%. Loffredo says munis are in the "eighth inning" of their decline. In fact, they already appear to be anticipating higher Treasury yields. This suggests that further downside may be limited, absent a big drop in the bond market. In short, this could be the time to dive into munis.